Busy women on the go can maintain their professional mobility with a fashionable laptop bag that means business. There are many bags to choose from that are ideal for laptops and have incredible style. The Concourse Rolling Briefcase by Mark & Graham is an option that will help you get around easily, especially if your job requires you to travel frequently. Thanks to the spacious bag design, this laptop bag provides space for not only a 15-inch laptop, but also a change of clothes and documents. Made of lightweight leather-like vinyl, this bag costs around $249 and is available in white or black. For a personalized touch, this laptop bag can be monogrammed. Although this bag is ideal for women who travel, if you simply want a laptop bag that will help you move through the city, this bag can certainly help you get the job done because it can function like a briefcase, thanks to the handles. The Geometric Medium Satchel by Calvin Klein is a modern-looking bag great for laptops that are between 13 and 15 inches. It has one interior zip pocket and two slip pockets, allowing you to tuck away belongings you'll need throughout the day. Whether you prefer to sit your bag on the table or on the floor, the bag is designed with protective tabs on the bottom to prevent scuffing. 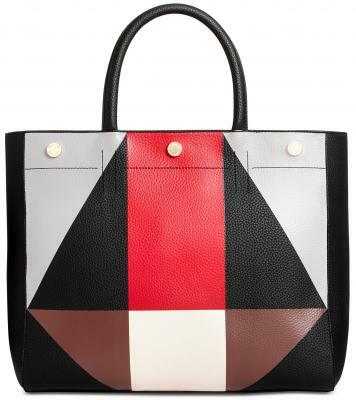 If the geometric print is too much for you, this bag also comes in solid colors such as red and black. (Which are more suitable for fall and winter months.) This laptop bag can be carried with either handles or an adjustable strap, and costs around $94. On days when you need to squeeze in some time at the gym prior to a meeting with your colleagues, there is a laptop bag that can literally supply all of your needs. The Birdie by Jemma is an all-in-one carrier that fits up to a 13-inch laptop. Made of water-resistant, lightweight nylon with vegan leather details, this bag costs around $198. This bag design is spacious enough to not only hold your clothing, but also a water bottle, and comes with a cosmetic case and small laundry bag. On the outside of the bag is a ventilated shoe compartment, perfect for when you need to switch your shoes. The Birdie is available in black, tan, and navy blue. Overall, this bag design has a business casual look at the most, but is not really suitable for dressier business days. 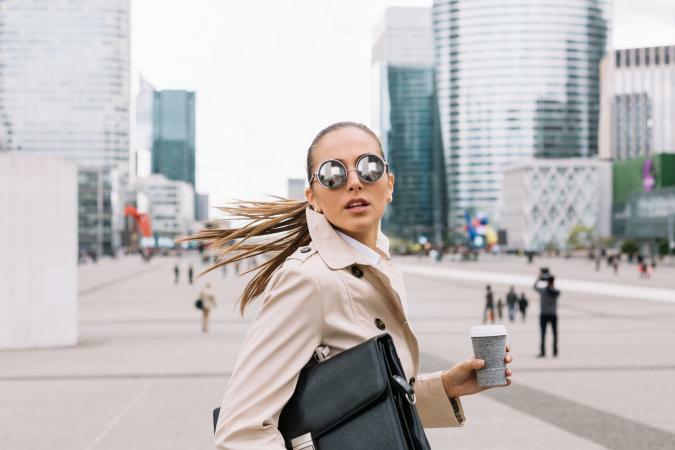 Staying in communication while on the go is a common practice for the fashionista who commutes. The Regan Tote by Rebecca Minkoff will not only store your 13-inch laptop, but also comes with a charging tassel to keep your phone battery charged. The leather laptop bag has zippers and gunmetal hardware that give it major edge appeal. The side zippers can be adjusted to make room for shoes to switch into if you wear flats during your commute. The Regan Tote comes only in black and costs about $275. Timelessness is everything when it comes to accessories. 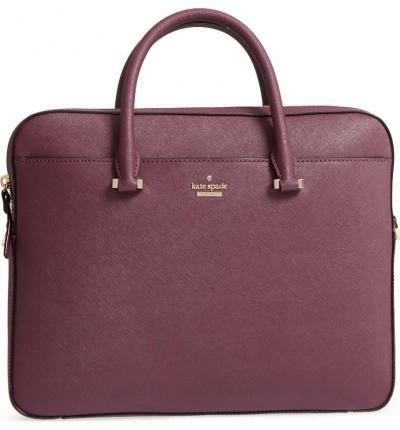 The Saffiano laptop bag from Kate Spade is a scratch-resistant leather tote that carries up to 13-inch laptops. The bag is designed with a top zipper, a few interior pockets, and exterior slip pockets, but beyond a laptop, cell phone, and a few other small items, you can't pack a lot within this particular bag. However, on days when you simply need a chic laptop bag to get you from home to a one-stop location and back, this is a great choice. The Saffiano costs around $298 and comes in gray and burgundy. Are you someone who prefers to switch up laptop bags each season? The striped floral canvas backpack by Henri Bendel is a great find for the warmer months. However, this bag style only comes in one color combination and the pattern, and its athleisure aesthetic makes it most suitable for casual days. The interior of this laptop bag is perfect for laptops that are 13 inches in height 11 inches wide. It has adjustable straps for comfort, and features a water-resistant interior lining. To keep all of your other essentials organized, this laptop bag also has additional pockets for your convenience. It costs around $78. If you find yourself looking for a luxe-looking bag that won't break the bank, this Double Zip Compartment Croc Tote From ASOS has a laptop compartment that fits up to 13-inch laptop and costs around $56. Designed with a magnetic button fastening closure, it also has interior pockets are great for file folders or other important paperwork you need to bring along. Available only in black, the bag's texture is great for colder months, but may be too heavy in appearance for warmer months. Working on the go means having all the essentials within reach throughout the day. There are many design elements for women to choose from while shopping for a fashionable laptop carrier. The Materials - Having your laptop or pad safely tucked away is while commuting is a requirement for many women. However, the protection provided by laptop bags varies. From the lining to water resistant materials to the padding, the design materials are all different. Whether shopping for a bag made of faux or real leather, nylon, or canvas, invest in a laptop bag made of good quality. Organize With Compartments - For the woman on the go, the organization is everything. Ideally, your laptop bag should have a room for documents, your laptop or pad, the power supply and other essentials you need to have within reach throughout the day. Straps - Consider whether you need shoulder or hand straps (or both). Make sure the bag you choose offers comfortable carrying features so it won't leave your hands or arms sore. The Right Style - Fashionable bags come in looks ranging from stylishly cute to sleek and formal. Make sure that the one you choose is appropriate for when and where you'll be wearing it. Making an impression is not just about your outfit, but also about your accessories. Function and style are two important factors for keeping your day on track while working mobile with a fashionable laptop bag. Owning the right laptop bag that fits your style and needs will help you to make boss moves through the day while looking fierce.